Hour of Code - Welcome to MVES Technology! We live in a world surrounded by technology, and we know that whatever field our students choose to go into as adults, their ability to succeed will increasingly hinge on understanding how technology works. Therefore, every student should have the opportunity to learn computer science which develops problem-solving skills, logic, and creativity. By starting early, students will have a foundation for success in any 21st century career path they choose. 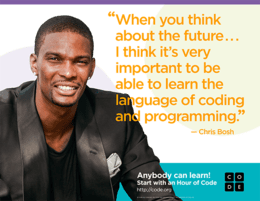 ​That’s why our entire school is joining in on the largest learning event in history: The Hour of Code, during Computer Science Education Week, December 3-9, 2018! Code.org’s Hour of Code is an introduction to computer science designed to demystify code and show that anybody can learn the basics. This global movement reaches tens of millions of students in over 180 countries and teaches students how to code in 40 different languages. Its design is to increase participation among young people across gender, race, ethnicity and nationality and to raise awareness about the importance of computer science education. We are looking forward to a very exciting, fun week in the computer lab during Computer Science Education Week as we once again participate in The Hour of Code! 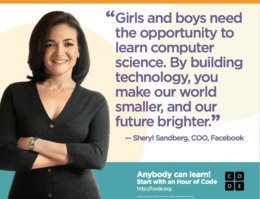 Click here to learn more about The Hour of Code!